If you have ever struggled with teaching your child how to tie their shoes, due to dexterity or coordination problems, this video might be of assistance to you. This video may change the way we teach kids to tie shoes. Thinking about this now (without a visual), it doesn’t make a whole lot of sense. What goes under? Make a bow? But, mom, that’s what I’m trying to learn! A more traditional teaching method that seems to have lasted decades is the old bunny ear trick. But, this has its own set of assumptions and fine motor skill requirements. Lucky for kids (and parents) these days, we can pull up YouTube videos for help, whatever the technique. One mom’s method is taking the internet by storm, and parents of kids with autism are really jumping on board. I tried this with my 11 yr old (who has autism) I’ve never been able to teach him. THIS WORKED!!!!! 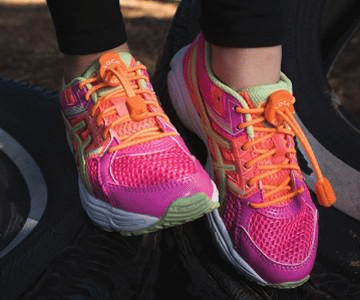 Kirstin Johnson, the brains behind Unstoppable Mother shared her how-to video on Facebook in August 2016, with the caption “The EASIEST way to teach your kids to tie their shoes for back to school!!! !” It presently has over 8.7 million views. One commenter summed up the benefits of this style perfectly, as some other commenters criticized Kirstin for the time it takes to execute. I don’t think it’s as much about speed as it is about making it easier for kids who’s [sic] motor skills make the traditional way harder. Learning to tie shoelaces is difficult for all children, but it can be particularly challenging for kids with autism. Autistic children can suffer from fine motor skill impairments that make it physically difficult to tie their shoes and executive skill deficits that hinder their ability to memorize multi-step sequences. I don’t know about you, but Kirstin’s video makes teaching this difficult skill look (dare I say it) easy. I can’t wait to give it a try with my 5-year-old. Do you have your own brilliant method? Tell us what you think. Related: Watching this baby with squeaky shoes will completely make your day! His giggle is infectious! This tip by Imgur user fuzzydustmite shows a revolutionary way to tie your shoes faster. You basically wind the laces around your thumb and index finger then pinch them together in one swoop. Next Benefits of music therapy for speech delayed…..